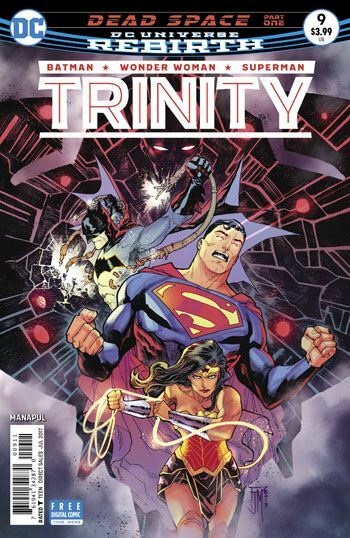 Francis Manapul doesn’t just write Trinity 9, he does the pencils and inks, as well as colouring it. He does not, however, do the lettering. Pfft. Slacker. Seriously, though, this is an excellent issue. Really creepy and suspenseful. Then the action really begins. Well, no. I’m lying. 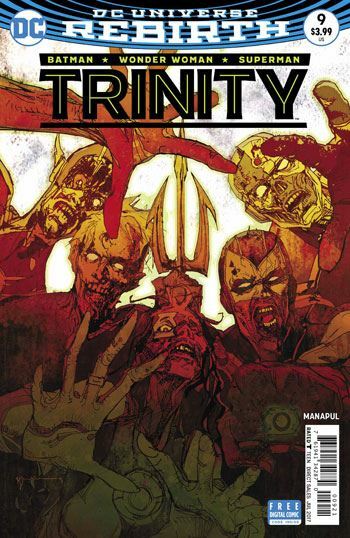 There was also a super eerie prologue in the Watchtower, showing the rest of the Justice League looking pretty dead. An alien entity has invaded the Watchtower, and for most of the issue we, and the three main heroes, explore the location, looking for any signs of life. This part of the story cannot help but remind one of Alien, and Manapul executes it all so well. He takes his time building the mood of the story, and the visuals are all so captivating that he easily achieves his goal. By the end of the tale, when the one other Leaguer who has avoided the aliens explains the situation, the payoff is appropriate and fulfilling. I really loved Manapul’s first story arc on this book, and everything in this issue indicates that another fun ride is coming up. A scary one.